Designing cards for guys can be tricky, especially if you like to quill (usually flowers dominate the scene), so here's an idea for the next time a card is needed for any male/any occasion. Father's Day, birthday, graduation, retirement - just change the sentiment. The quilling reminds me of a compass, fitting for all those events that lead one in a new direction. A stress-free way to line up coils for this design, as well as when making quilled snowflakes, is to assemble them on a clear, acrylic sheet placed overtop a sheet of graph paper. My pattern is in the May issue of CardMaker Magazine, along with additional fab quilled designs by Alli Bartkowski and Charlotte Canup. The issue features lots of other cardmaking techniques as well. I have an extra copy and would love to send it to a lucky reader. To enter, leave a comment by the end of Monday, May 24 and I'll randomly select a winner the next day. A book on card making techniques is a great giveaway. You make such wonderful cards!!! How wonderful that your design is in there--I'd love to see a copy! You're right - it is always difficult to create a card for a man, especially a quilled one. I've been having fun making my own cards, and while I haven't gotten into quilling yet (I'm thinking it won't mail all that well), I do enjoy trying new things! I would love a copy of this magazine! Your card is wonderful ... a great way to quill for a man! LOL! Congratulations on having your pattern appear in the magazine! You're so right about cards for men - I don't think I've managed a quilled one for one yet. Quilling is so much fun. 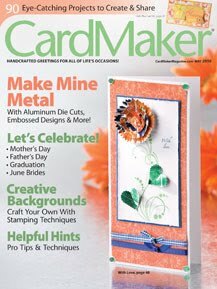 I'd love to win the Cardmaker magazine! Thanks everyone. Natalie, rolled paper is surprisingly strong, so I find it goes through the mail okay as long as I put a piece of bubble wrap over the quilling. It also helps to insert a thin piece of cardboard in the envelope to keep the whole card flat. I would love to have this magazine!!!! Thanks a lot for the opportunity! Congrats and thanks for re-igniting my interest in paper quilling. Love that card, what a great idea. Congrats on having your pattern in the magazine. Great card! Love the layered aspects and the grid just makes it all pop. Thanks for your generosity and wealth of inspiration. Love your blog. I love your blog! Between it and the new things I learned about at NAQGCON, my newfound obsession with quilling has rapidly become an obsession with paper. Who knew? What a fab idea for a male card!! Hi Ann, Thanks so much for dropping by my blog and I am SO happy to have discovered your blog. I am surely going to make many many turns to be inspired by all your great work. What a wonderful way to use "flowery" quilling for a man! Love it! Love you designs and love that magazine! Please enter me to win it! Thanks for sharing! Congratulations!!! !I'd lov eto have it!!! i came across your site,and your talent of quilling by accident. very long time.and the fact that it's paper really threw me. i have been reading all i can on the net,i looked up books but they are costly for me right now,and i could not find a magazine for quilling.i would be thrulled to win this magazine,especially if it has your art in it along with others[as you mentioned].i want to thank you for sharing your art with us here on the net,you are quite talented. if i win great,if i don't i'm still going to try to teach myself how to quill. thank you again. I make bulk cards to sell in packs. I have just made the basic cards suitable for Father's Day and male birhdays. I did some paper mosaic on them, but they needed something else. Quilling would just do the trick. Thanks for the inspiration. Congratulations on having your pattern published in the magazine! Thanks for a chance to win. Please withdraw my name in favor of Nannie....thanks! WOW ,SUCH A GOOD GIVE AWAY. GREAT FOR BEGINNER LIKE ME .IF I WIN ,IT WOULD BE MY LUCKY CHRISTMAS.